The Cuisinart DCC-3000 carafe-free coffeemaker features an easy-to-read Coffee Gauge™ to show remaining cups of coffee. The machine brews up to 12 cups of hot coffee cup by cup and offers 24-hour programmability, self clean, auto shutoff and 1 to 4 cup setting. The machine has an easy-to-use actuator which dispenses one cup coffee at a time and with its removable water reservoir fill-ups becomes more easier. Other highlights include removable drip tray, removable coffee reservoir, permanent gold-tone basket-style filter and a charcoal water filter for removing impurities. The Coffee On Demand Coffeemaker 12-Cup Programmable Coffeemaker has many exciting features for users of all types. You can extend the lifetime of your Coffee On Demand Coffeemaker 12-Cup Programmable Coffeemaker with the purchase of a FactoryOutletStore Factory Protection Plan. See the Coffee On Demand Coffeemaker 12-Cup Programmable Coffeemaker gallery images above for more product views. 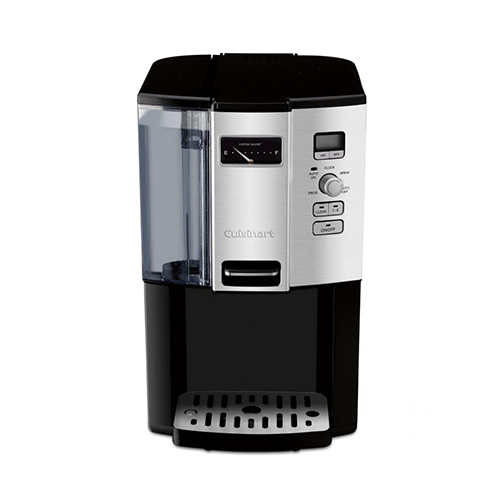 FactoryOutletStore stocks a full line of accessories like Cuisinart DCC-RWF, Cuisinart DCC-RWF-12-GTF, and Cuisinart DCC-RWF12 for the Coffee On Demand Coffeemaker 12-Cup Programmable Coffeemaker. The Coffee On Demand Coffeemaker 12-Cup Programmable Coffeemaker is sold as a Brand New Unopened Item.